Nutcracker Travel Mug Sale Extended! Good news: There’s still time to get your beautiful Nutcracker travel cup! The Parent Guild has extended the sale through Halloween. Get one for you and one for your favorite dancer! Ad sales and apparel orders due this Saturday! Just a friendly reminder that order forms and money for our program ad sales, Nutcracker apparel, posters, and travel mugs are due this Saturday, October 17. 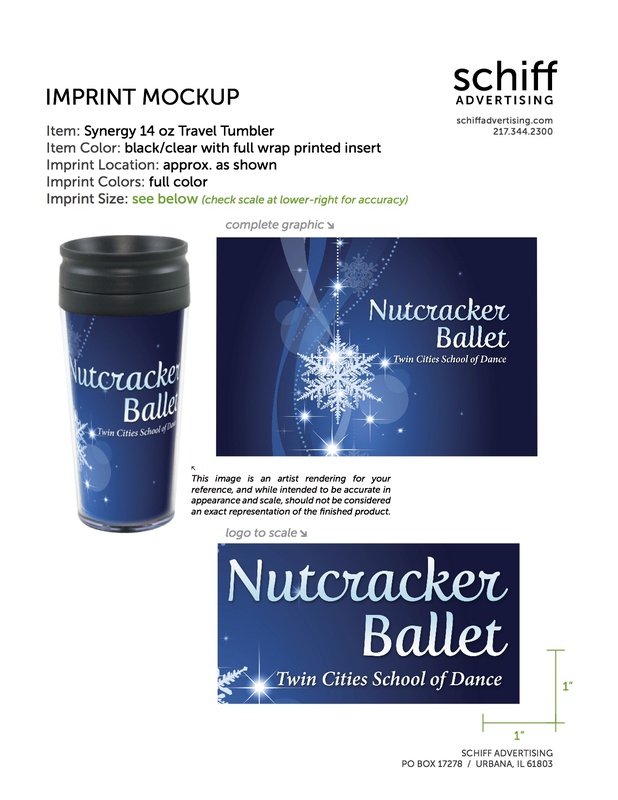 Nutcracker shirts and posters make great dance gifts and keepsakes, and the Guild is excited to offer travel mugs for the first time (see the pic, below)! And, the ad sales are crucial for funding the printing of our glossy full-color programs, so let’s make one last big effort and buy or sell an ad! Calling all coffee lovers: our first ever Coffee Hound fundraiser starts this weekend! The owners of Coffee Hound have generously partnered with us to sell a variety of coffees, including a special Nutcracker Blend. Twin Cities School of Dance will earn $5 from the sale of each bag of coffee. Tea-drinkers and cocoa fans aren’t left out, either: the sale includes a special hot chocolate mix and a gingerbread-orange tea. Order forms are available at the studio starting October 10 (or instantly downloaded from this post), and sales will continue until November 7; coffee will be distributed November 29. We’re hoping every dancer will participate in selling this delicious product; all of these items would make great holiday gifts or teacher thank-yous! Nutcracker Apparel and Travel Cups Available Now! It’s that time of year again: Nutcracker season! Apparel, posters, and—for the first time ever—travel cups are now available for order. The travel cups are made of durable BPA-free material, and feature our Nutcracker poster design between two clear layers. They also come with a slide-lock lid perfect for on-the-go families. We’re also selling yoga pants this year in addition to various shirt styles. Order forms are available at the studio, on the studio website, or here below. These items make a great gift for your dancer!